Engineer-Animator-Entrepreneur | CEO@Pencillati | Passionate about CG Art & Animation| Ambidextrous, swings b/w spreadsheets & sketchbooks| Loves trail running. - Entrepreneurs Wanted - http://bit.ly/Connect2Success - Contact the person who shows this to you for opportunity presentation. Landing page optimizer. Growth marketer. 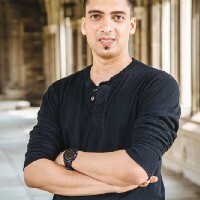 Founder of Earnworthy and Landing Page School. Host of 2 podcasts. Follow me at @nscalice.